Discussion in 'Custom Cases & Projects' started by sergiiua, Mar 21, 2017. This case is small in size, designed for maximum compatibility of components. You can not worry about overheating the components inside. It is recommended for assembling beginners. - Storage: 2 x SSD 2.5"
Acalanata, Weredawg, VeeTeeF and 4 others like this. Do you have a render showing component layout? Struggling to see how the PSU cables are managed. Good work, loving the effort. In two words, component layout is the same as in Dan Cases. Totally awesome. This is promising! I like the front side facing USB 3 ports. Is there any room up top to install some hot-air exhaust fans? How does this go together…? 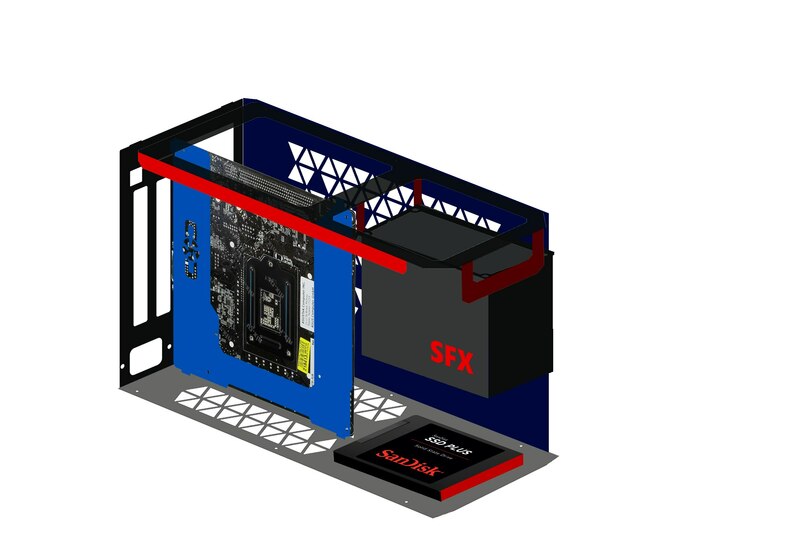 Seems like the area where the PSU goes would be under a good bit of strain with the PSU just hanging there until everything is assembled & buttoned up…? Where does the 2.5" SSD go, and what are the thickness limitations of same; single 7mm, dual 7mm, single 15mm…? So, front power button & USB; what about the audio I/O…? Looking forward to seeing a prototype model; a build video of same would be extra awesome…! Shhh. I'm sure you thought of the layout yourselves Is the right-angled PSU extension cable included with the case? Model in the first post updated. Audio I/O will be too. As option. Would not a single 15mm fit as well…? Also, any plans for a plastic sheet divider (you know, like in the A4) to prevent components from shorting out on each other…? I think, no. Moddiy/LiHeat risers are well shielded. No problems with my CustomMOD Mini. So, I can use a PSU I already have, AND I can do so in the smallest chassis possible…? I am definitely down for one unit from Batch #2…! It will be a birthday present to myself…! When can we see some real pictures? 1. Are rounded corners for the front plate an option? 2. Would a drilled-hole venting design (similar to the DAN A4-SFX) be possible? 3. Could the power button be moved to the rear of the case? 3. What is maximum gpu depth with/without backplate? 40/45mm? 4. Like the NCase M1 and Dan A4-SFX, would you do a sticker or plate with the case name, batch run, and production no.# on the rear of the case? I was just about to marvel over this case again but the links to the images are now broken? No, our partner (ESI METAL factory) can't do this now. Yes, I'll add this option in order form. SIEGEX, Secretagentk and Flexon like this. Thanks for answering my questions! I'm PM'ing you now to order one.